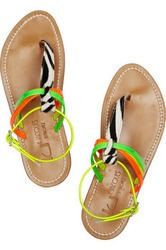 Mixing colors and prints is the official anthem of summer - and these sandals should be the honorary representative. What better way to jazz up a maxi dress or micro mini shorts than with neon and animal print together - on your foot nonetheless. Being the neutral gal that I am, I'm the Switzerland of fashion for all you new readers, one might think I would scoff at such a mish-mash offering for my feet. But just the opposite - I find that having a party south of my ankles, especially in the name of summer lovin', is not only suggested but rather mandated. Blame it on the heat and humidity if you must - but I would wear these proudly and loudly.